If you were to make a list of animals rarely seen in our area, you probably would not put a salamander on that list. However, spotted salamanders (Ambystoma maculatum) are one our region’s most elusive finds. Surprisingly, it is not due to their rarity. But rather, their lifestyle. Scientists group spotted salamanders into a family of salamanders often called the mole salamanders. As the name implies, they spend the majority of their time in the ground, and the months of February and March are really the only time you typically see the adults topside. This is because they make a breeding migration from their underground homes to a special type of wetland called vernal ponds. These ponds are perfect for spotted salamanders to breed and for their young to grow. Spotted salamander eggs with larvae inside. After a late winter’s rainy night, freshly laid clumps of gelatinous eggs can be spotted with the adults nowhere near to be found. These clumps usually contain 75 to 100 eggs, and swell in size after they are laid. This is where the real fun begins; spotted salamanders can be involved in a symbiotic relationship with the green algae species Oophila amblystomatis. A symbiotic relationship is one where two organisms live so closely together that you can think of them as being linked. As the salamander grows, it breathes out carbon dioxide from the egg lining, providing a nitrogen-rich environment for algae to grow. Algae, which forms on the outside of the clump, then uses the oxygen to grow. In turn, the algae produces oxygen as a byproduct of photosynthesis, which the salamander uses to grow. In this case, both organisms benefit from the relationship (which is not always the case in symbiotic relationships!). 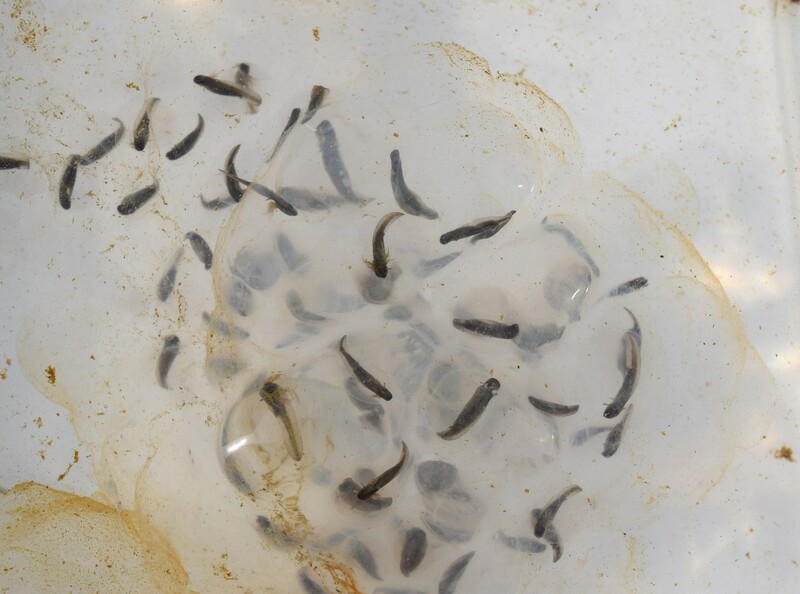 The larvae will eventually grow big enough to leave the pond around June. At that time, they bury themselves down in the ground looking for food until the conditions ripen again for our cool winter rains. Even though you might not see the elusive adult spotted salamander, you can see the result of their handiwork at a vernal pond near you.